Israel is the only nuclear power in the Middle East. The country is reported to have between 100 and 400 nuclear weapons. While Israel has never officially admitted this fact, Israeli leaders periodically threaten their use. 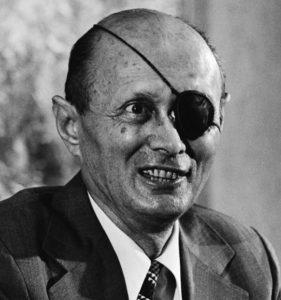 In 1973, when Israel was losing what it calls the “Yom Kippur War,” Defense Minister Moshe Dayan (pictured) came close to using nuclear weapons, until U.S. Secretary of State Henry Kissinger engineered a massive airlift of U.S. weaponry to Israel, the largest airlift in U.S. history. “In the Middle East, and in many parts of the world,” Netanyahu said, “there is a simple truth: There is no place for the weak. The weak crumble, are slaughtered and are erased from history while the strong, for good or for ill, survive.” The way to “peace,” he said, was for Israel to be strong. Netanyahu: “Our enemies know very well what Israel is capable of doing.” Photo is of Gaza destruction, August 2014, from Israel’s”Protective Edge” invasion. On May 8th, President Trump pulled out of the Iran agreement, a move promoted by Israel partisans in and out of his administration. Unlike Israel, Iran has no nuclear weapons. And, despite oft-repeated claims by Netanyahu, U.S.politicians, and many in the American media, U.S. intelligence agencies and others have concluded that Iran is not working to acquire them. Iran, unlike Israel, is a signatory to the nonproliferation agreement. The 1976 Symington and Glenn Amendments to the Foreign Assistance Act prohibit U.S. aid from being given to countries that have not signed the nuclear nonproliferation agreement. The following year a Pentagon report also documented the Israeli nuclear weapons program. Despite that fact, U.S. aid to Israel has continued. According to the think tank Research: MIddle East Policy, Israel has so far received approximately $234 billion in illegal aid. A package to give Israel $38 billion over the next ten years is currently before Congress, the largest such aid package in U.S. history. So far, U.S. media have failed to tell Americans about the legislation. Aid to Israel is also illegal under the Leahy Laws, which prohibit U.S. aid to countries guilty of human rights violations. Israeli nuclear facility. Originally named Dimona, it was renamed the Shimon Peres Negev Nuclear Research Center on August 29, 2018. It is widely believed to be producing nuclear weapons material. Is France Quietly at War with Turkey? Towards a “NATO-Exit”? Shift in the Structure of Military Coalitions. Turkey’s Alliance with Russia, China & Iran?